Pretend like it’s the weekend. Now. – Whole Wheat Banana Flax Pancakes | EmmaEats…and Katie too! It’s March Break! It’s maple syrup season! It’s a whole week of gorgeous weather ahead! Could it be spring is nearly here?! With the sudden warm and sunny spring-like weather (who said March comes in like a lion? ), Emma, Katie and I are all eager to get up and moving. And of course, with it being March Break for Emma, we’re also hoping to get out and do a bunch of fun activities with our family and friends. We’ll be making this week a full week – and that means I’ll be looking for quick, easy and energy-filled food to fuel Emma. One of our outings this week will be to a local maple syrup festival. Wagon rides, hiking trails and maple syrup samples ahead. And what goes with maple syrup better than pancakes! 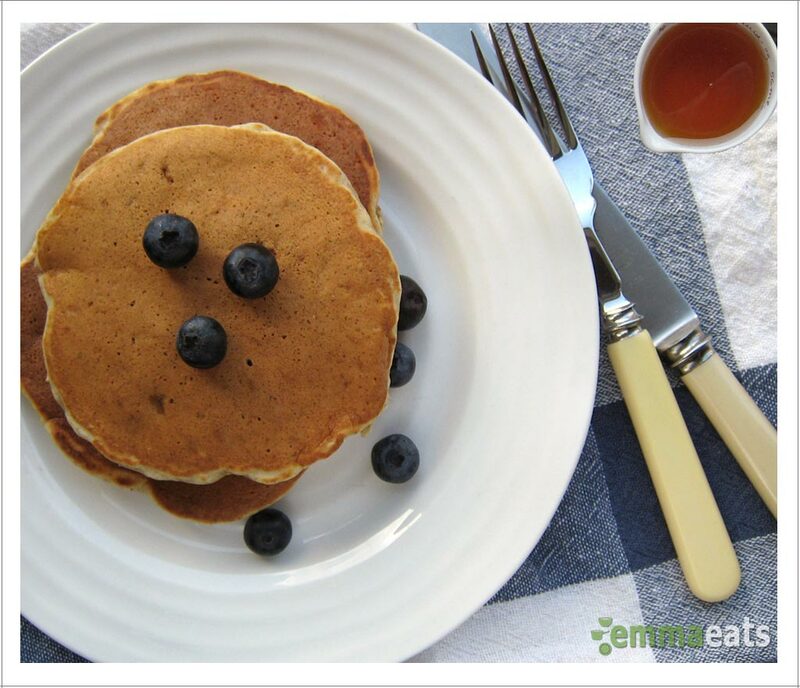 Pancakes are incredibly popular at our house — Emma has them weekly. As a result, we find that there are leftovers which turn into delightfully no-mess, easy to grab-and-go snacks for a day or two after we make them. Since Emma’s eating them often, it seemed high time for a recipe makeover to help improve the nutritional value of them while not sacrificing the taste. I have to admit, I really like the fact that she can pick up a pancake on our way out of the house — she ends up with a happy full tummy and I end up with no crumbs on her clothes or in the car! I feel like these are now super healthy improving our regular perfect pancake recipe – adding omega 3’s, fibre, antioxidants in the cinnamon and blueberries and low in sugar. Seems like a good option for breakfast or in our case, snack time, to me. I think you may know someone who’ll enjoy them too. Pre-heat a non-stick skillet to medium-high. In a medium bowl, whisk together the flour, ground flaxseed, baking soda, baking powder and salt. Add the banana, milk, egg, melted butter and vanilla and mix until combined. Let the batter sit for a few minutes.